PIPNI Review 2019: Is PIPNI a Good Hosting? Based in the Czech Republic, PIPNI offers attractively priced plans that will be particularly attractive if you already know how to build a website. Hosting vendor PIPNI is based in the Czech Republic. It offers web hosting and multi-domain hosting with and without SSD-based storage, plus reseller hosting, VPS, blade servers, and microservers. The PIPNI website can be viewed in Czech and English, but not all the text is translated in the English version. An SSL certificate is essential for your website’s security and to help secure its search engine ranking, so PIPNI offers a Standard or Wildcard SSL certificate for free on some plans. PIPNI supports several programming and development tools, including PHP, MySQL, and PostgreSQL, plus the Zend Optimizer that improves the performance of PHP applications by a factor of 40% to 100%. Note that there is no support for Python, and this Linux-only host offers no support for Microsoft technologies. So far, so good (but not great) for expert webmasters, but beginners get no website builder and no one-click installer, so this provider’s plans will be more useful to you if you already know how to build a website using only an HTML editor. While PIPNI’s web hosting plans provide sufficient storage for more than one website, it also offers multi-hosting plans for web developers and hosting resellers who have hundreds of domains. PIPNI offers a free plan that provides more storage space (10 GB) and bandwidth (1 TB) than you would get on many paid plans. But you get no automatic backup, no uptime guarantee, no free domain registration, no support, and no free SSL certificate. Despite this vendor’s limitations, not just on the free plan, pricing is where it gets things right. The paid hosting packages range from low-priced to reasonably-priced for the features you get. You can pay for plans on a monthly basis, and there is a 30-day money-back guarantee for further reassurance. Customer support can be obtained by telephone, ticket, email, and live chat, but your support options depend on the plan you choose. For example, the lowest paid plan provides only email support, and you have to be on the highest (VIP) plan to take advantage of telephone support. I tried the ticket support route and received responses to my queries. For self-support, there is a ‘Manual’ FAQ page that contains some answers and very few tutorials. 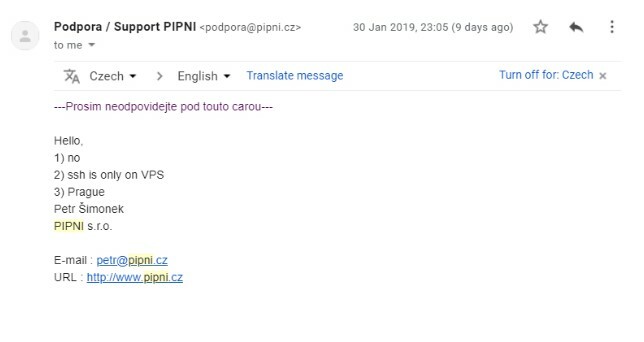 If you’re an experienced Linux webmaster looking for Czech hosting, then PIPNI should be put on your list of hosts to look at. If you’re looking for beginner-friendly web building tools, you should probably look somewhere else. 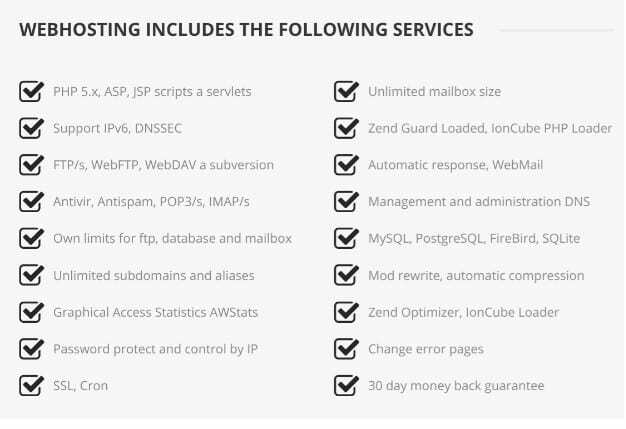 Wondering how PIPNI stacks up against other Web Hosting companies? Enter any other Web Hosting company and we will give you a side-by-side comparison.